Serve your beverages in style with this Libbey Glassware 15232 Room Tumbler. Part of the Gibraltar Collection with a DuraTuff design the Libbey Glassware 15232 Room Tumbler has 10 ounce capacity and a 3-7/8 inch height. 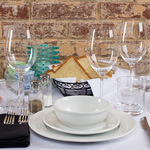 Sure to impress your guests this Libbey Glassware 15232 Room Tumbler is a fine addition to any bar or restaurant service.